With fish being Sammy’s new favorite thing, I noticed he really liked the Windows aquarium screen saver (which came with Windows XP Plus), but I felt it didn’t have enough variety. After a bit of research, I bought Dream Aquairum for $20. (You can try it free, but to remove the nag messages and unlock all the fish, you gotta pay.) 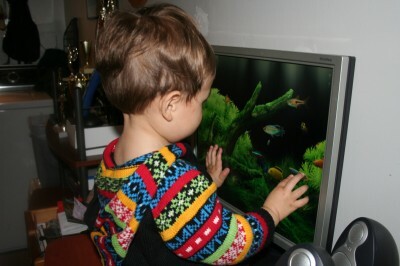 I think the program is really beautiful, and the fish animations are very lifelike. During his visit to Tacoma around Christmas, he started playing with Kira’s fishing set. This is just a magnet on a string attached to a stick, used to pick up wooden fish out of a tray. He loved it, and played with it so much that Kira got a bit upset. 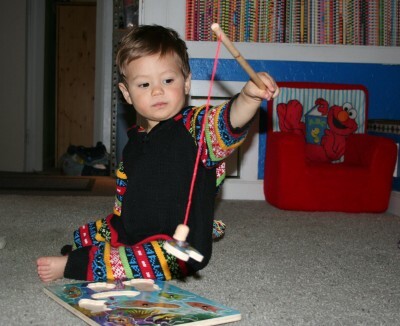 After we got home, sometime in January I got him a set of his own, a magnetic fishing game from Melissa and Doug toys. (The supplied magnet wasn’t strong enough, so we had to glue on one of our own.) Sammy is very pleased every time he catches a fish. As tempted as I get sometimes, I don’t want to keep a real aquarium at all. (Some of my friends, like Jason W., have some impressive ones.) I don’t know anything about keeping fish (and lack motivation to learn), and I’d rather not deal with ongoing maintenance, feeding, and expenses to replace the inevitably dying fish. Less than $20 for a beautiful aquarium that never spills, can have as much stock as I want, and can be switched off at will — that’s more my speed. Sammy’s too. Fish! Fish! Fish! This entry was posted by Stephen on Wednesday, February 21st, 2007 at 6:45 pm	and is filed under fish, photography, Sammy. You can follow any responses to this entry through the RSS 2.0 feed. You can leave a response, or trackback from your own site. I check your blog at least once a week looking for new pictures of Sammy, He is soooo cute!! Thanks to you and Kimi for the one you sent us in the mail. It is on my fridge. Take care Derek says Hi. Hey Barbara — thanks! I snuck in a few older pictures too; check out the Photography category for more.